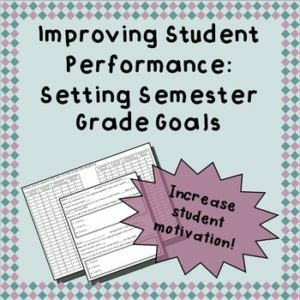 Help your students stay motivated to earn good grades! Every year I would have students who became discouraged and lost motivation after the first (or third) quarter because they had earned a low grade. They just gave up because they didn’t think there was any point to doing well the next quarter. I found that if I taught them how the district calculated the semester grades, I could help them make goals for themselves. For example, a student might have failed the first quarter, but once they realized they could still pass the semester, depending on how they did 2nd quarter and on the semester exam, their motivation skyrocketed. This is a GREAT way to help students “own” their education and grades, and works wonders for low-performing students. You MUST understand and be able to teach the method your district uses to calculate semester grades. If you are not comfortable with numbers and calculations, ask a math teacher at your site to either help you learn how to do it or to do this in their class. I had so many students use this lesson to set goals for themselves in other classes besides mine – it was amazing. I have included student goal-setting sheets as well as a chart that outlines grade combinations based on a 40/40/20 weighted grading system (40% quarter 1, 40% quarter 2, 20% semester exam grade).